Superman #15 - "Does the Boy make you uncomfortable? He should. But since you asked so politely...I trust you're inquiring about H'El." The last time we saw Lex Luthor, he was working with both the U.S. government and (secretly) Brainiac in Action Comics, just as Superman was really coming into his own in Metropolis. Fortune has not been kind to Lex, who now evokes comparisons to Hannibal Lecter! 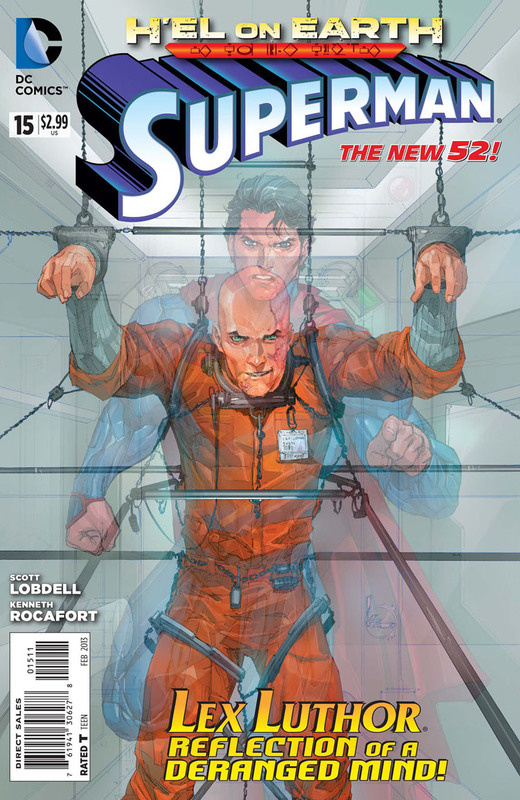 Lex is locked away in a prison of his own design, never to see the light of day again due to his crimes. This is where Superman, with Superboy in tow, arrive. 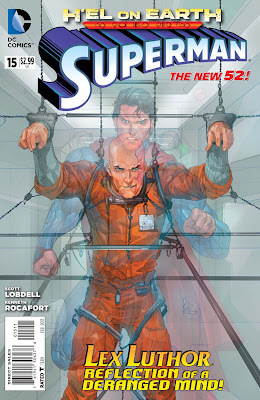 The Man of Steel needs Lex's opinion...is what H'El says possible? Can he achieve time travel and somehow SAVE KRYPTON? And if so...at what cost? At least, that's the premise of Kal-El's visit to his old enemy. The subtext is...well, there's a lot more going on here than appears on the surface. Both Superman and Superboy are disturbed by their meeting with the "Earth's Greatest Human Intellect." "H'El on Earth" just got real! Oh, by the way, Kenneth Rocafort is a tremendous artist! I can barely turn a page of this comic without being impressed! He was awesome on Red Hood and the Outlaws and he's hit an even higher gear here! Awesome! Lots more, including Teen Titans, Batman, Incorporated and The Flash after the JUMP! 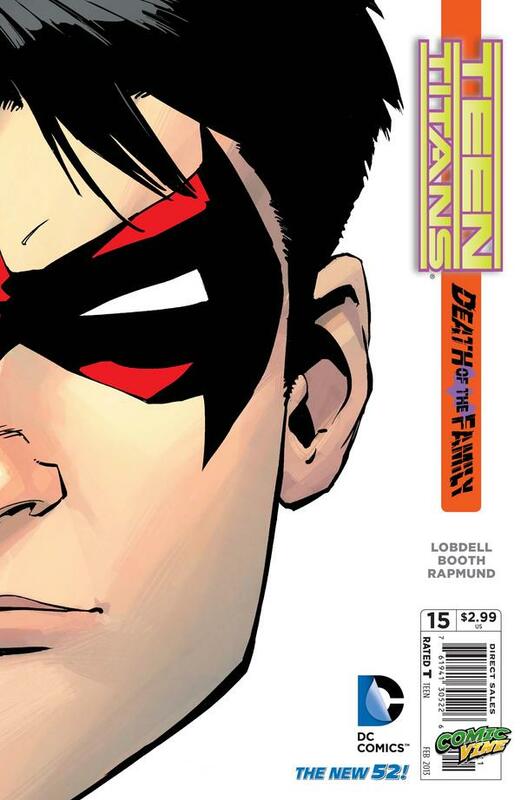 Teen Titans #15 - "By the by, the knot in your gut right now is called abject fear. Tastes a bit like chlorine and beets, right?" 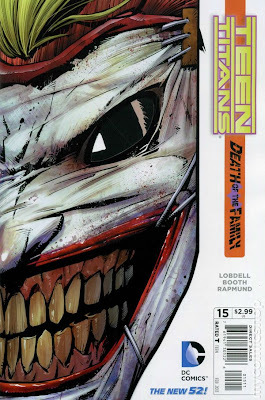 "Death of the Family" makes life hard for Red Robin this month...the Joker's kidnapped him as part of his ongoing maniacal plot to "strengthen" Batman by ripping apart the Bat-Family! 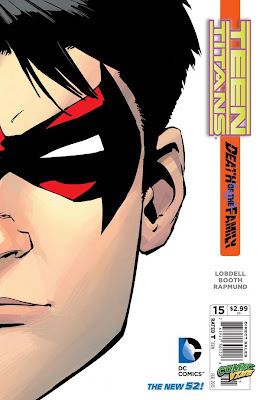 Joker's doubled down on his plan with Tim, by deciding to use his OTHER family, the Teen Titans, against the third Boy-Wonder, just as he's using Red Robin against Batman. Clever! 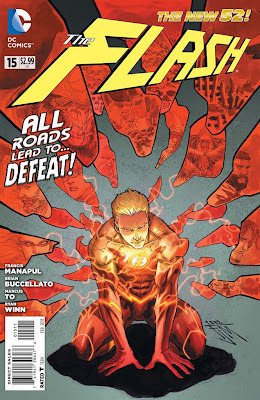 The Flash #15 - "Thoughts. Like memories of things I haven't seen...things I haven't done...yet." This could very well be Barry Allen's darkest hour...he's been knocked unconscious and crushed by a dying ape..which beats the alternative of being impaled by a traffic sign! Thanks to the sacrifice of a time travelling ape named Solovar, the Flash is alive...but in a coma! At least Patty Spivot (who incidentally, has learned Flash's secret identity) and Turbine arrive to help...and a slim hope appears! King Grodd shows a weakness...his mastery of the Speed Force is a temporary ability...it wears off!! Meanwhile, Captain Cold and the Rogues are trying their hardest to save as many people as possible in Central City from the apes run amok! The Army wants to lend an assist, but are trapped outside of the city under the impression that it is a nuclear hot zone! Of course it's not really, one of the elder, shaman apes is creating an illusion (under duress, I may add). 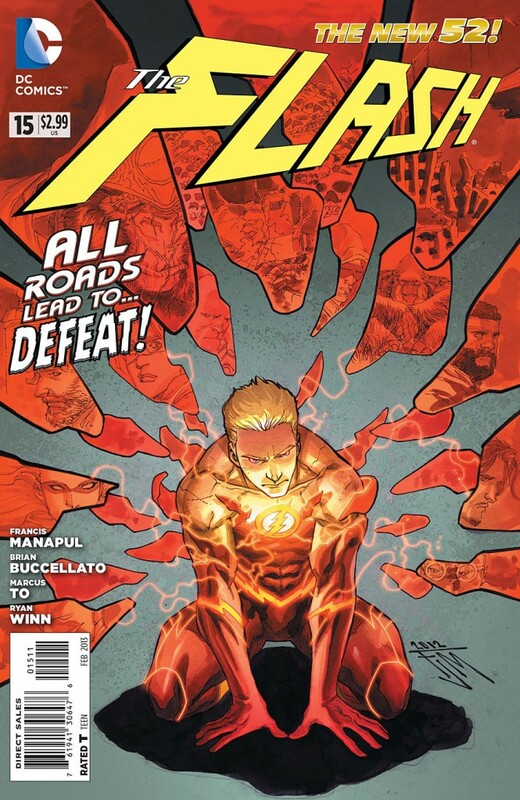 Everything that's happening may well be futile if the Flash can't wake up and find a way to stop Grodd! In his coma, there is some hope, as Barry enters the probability-trance of the Speed Mind! Of course, the last time he tried to use that power, it almost got him killed!!! Batman, Incorporated #6 - "Gotham. Or Damian. Whichever you choose, the other dies." 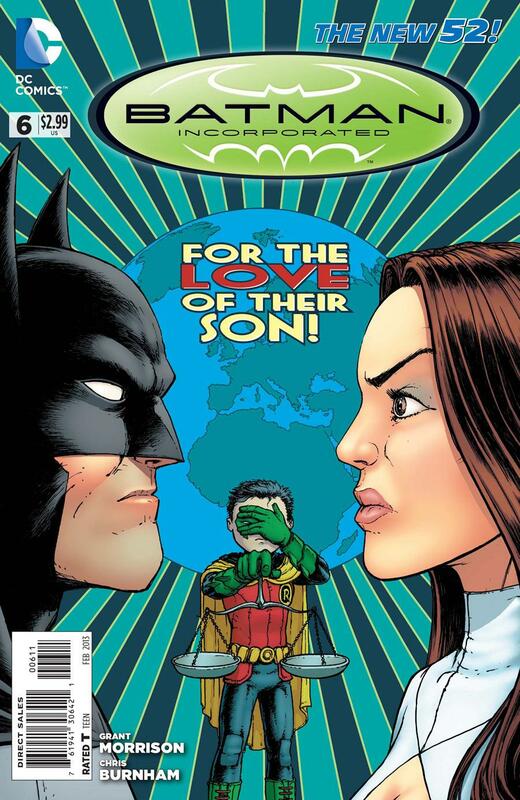 Everything's beginning to come to a head for Batman, Inc as Talia Al Ghul, takes her master plan to the next level! Batman has to run a literal gauntlet of death as he tries to get to his injured allies atop the partially blown up complex where Talia's base was located less than a day earlier. Death trap after death trap arise to stop the Caped Crusader, making him seemingly TOO LATE to save AT LEAST one of his "soldiers" in the fight against Leviathan! Talia (whom it's confirmed has been listening in to the "secure" frequency of Batman, Inc the whole time) taunts Bruce constantly as he tries so valiantly to achieve the top of the building and rescue his fallen friends. She seems to want to break his will as much as his body...even Bruce himself questions her motivation...she's more destructive than ever before! This issue really amps up the action. I know there's still another six to go to finish the story, but it seems like it's already starting to come to a head! Talon #3 - "So run little Talon. Run." 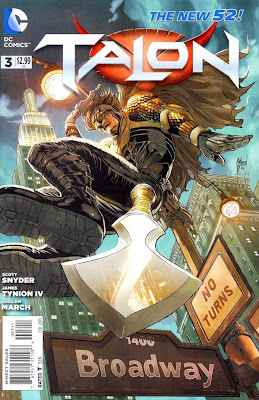 Talon continues to gain momentum this month as Calvin "Talon " Rose travels to New York City from Gotham to warn his ex-girlfriend Casey and her daughter Sarah that the Court of Owls may be gunning for them. He finds more than he bargained for as his ex, bitter from him leaving to "protect" her all those years ago, has created a sort-of super-villain henchman underground railroad, helping, say the third Basilisk super-strong henchman from the left to secretly leave the organization and start a new, less fiendish life! To prove she means business, she hacks into Calvin's communications with his backer, Sebastian Clark, and offers to assist him in a plan to rob a bank where the Court of Owls keeps billions of dollars! It's nice to see some more characters come into this book, and the overall plot of this book continues to get more interesting as subplots arise. However I still wish there was less exposition, as a lot of the story is told through dialogue bubbles. Regardless, I think the title is getting stronger as it goes forward...this issue is a definite improvement over last! Batman The Dark Knight #15 - "I can't. I promised him. I promised." 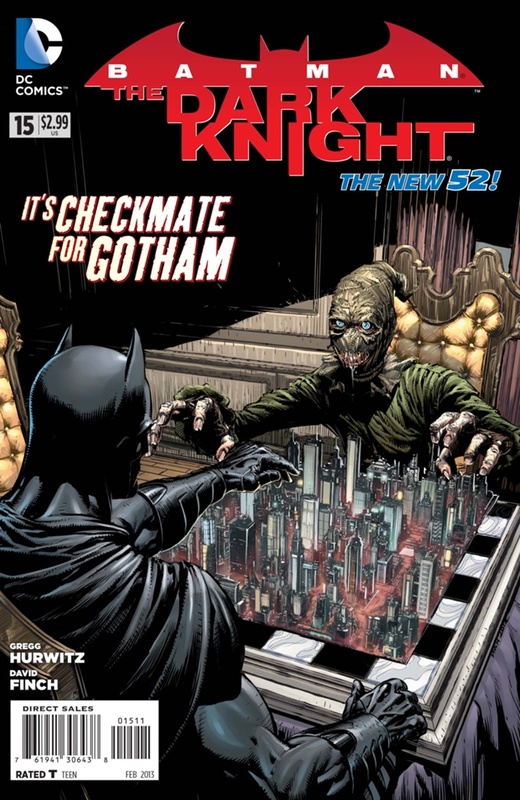 Last issue, Batman managed to escape from the Scarecrow's dungeon and free his hostage in the bargain, but the Scarecrow got away. This issue he's launched his attack on Gotham City...his new fear toxin is spreading like a virus in Gotham Square! The anti-bodies to create a cure are in Batman's blood...however, it will take days to synthesize the antidote while the city will tear itself to shreds in mere moments! Batman's unlikely solution to this dilemma is to skip the synthesizing process and turn his blood into the antidote to the toxin directly with all-powerful technology and then shoot it out of the back of the bat-jet in aerosol form. Of course. Then he makes his son, Damian "Robin" Wayne promise to remote-pilot the bat-jet until all of the infected people are cured, even if it means killing him! Alfred is (justifiably) really mad! This is the last of a three-part story that I personally wish had ended after two-parts. The story was so promising over the last two issues, but this is a pretty weak finish. Not only is the solution preposterous, but Bruce, Damian and Alfred all act subtley out of character...none of them seem quite themselves in this book. Oh well, it's only new writer Gregg Hurwitz's first try, and there were a lot of plot points in the overall story that showed promise. Better luck next month! Good comic week! AND it all begins anew Tomorrow! New Comic Book day and the first issue #16's...Action Comics, Detective Comics, Green Arrow and more!! Of course I wrote another Stryder's Dementia...what do I have planned in 2013? Find out! !